This new thing of flying the Pitts was going so amazingly well that today was a good test. Not of my flying but of…I’m not sure what. My will? My interest? My determination? I flew poorly, or at least not as well as I’m capable of, for the first half of the lesson. It started with a botched takeoff that was so bad Bill had to take control. Then I botched my arrival at Easton and my next five trips around the pattern were humbling. I was behind the airplane, sloppy in judgement and control, and generally failing spectacularly to be spectacular. The most worrisome part: I wasn’t having fun. I take solace in knowing they were all landings, safe and effective, if not good landings. I have a hunch, based on nothing of course, that it’s these kinds of days when many of the incidents and accidents that make up aviation’s safety statistics are more likely to come out to play, seek us out wherever we are, and bite us. Today was incident free. But how would I have fared if presented with something simple like an unexpected request from ATC, a system malfunction, or an emergency? I’m being a bit melodramatic in my analysis, but humor me for a minute. After all, Bill was in the back seat doing his Instructor thing, acting as PIC (Pilot in Command), and well aware of my struggles. The chances of an accident chain escaping both our notice, while small, is never zero. But while I’m spending brain cycles analyzing my performance I have to remove Bill from the equation, just as I do to some extent while I’m flying. Of course I’m relying heavily on him for instruction and guidance, but at the same time there is a delicate balance between self-reliance and over-reliance. I trust him to keep us safe, he’s a better pilot than I’ll ever be, but to grow as a pilot I need to take an increasing amount of responsibility for the flight. How much I rely on him is relatively large right now but needs to go down as I get more experience in the airplane. Remember, the goal is not only to be safe, but have fun as well, when there is no one else around. If I’m not “pushing the boundary” of reliance, I’m not advancing as quickly as I could. The good news is I flew fine for the second half of the lesson. After fueling at Easton we headed down to Cambridge for more circuits and I was on again. I take heart in this because hopefully it means I was able to forget the mistakes and not let them affect what came after. The alert reader might notice this flight was the same day as my fun aerobatics flight with Dan. In fact Bill and I took off about 90 minutes after Dan and I landed, with lunch in between. The full analysis is I was probably still recovering physically from my first exposure to aerobatics. In future I’ll plan flight training further removed from any aerobatic exertions, like the next day. Onwards and upwards…and hopefully some upside-down, too. Today I consider to be my first, true experience with aerobatics. Oh sure, I took a .8 hour ride in a Pitts 17 years ago and Bill showed me a loop, roll, and hammerhead turn on my first flight with him. But today I actually flew aerobatics!! It all started about a year ago. I happened to be at the airport on a Saturday morning when I saw Bill’s hangar open and the Pitts waiting patiently inside. I couldn’t resist and uncharacteristically intruded on he and his student by asking to take some pictures. Bill said sure, offered to roll his airplane out into the brilliant fall sun, and also pointed out there were four more Pitts in the open hangar next door. I couldn’t have been more excited. That was my first introduction to Bill. That morning I also met another Pitts pilot named Dan. He was working on his plane and was very open to my questions and interest, sharing great enthusiasm for both aerobatics and the airplane. I don’t know if I made a pest of myself but I was thrilled when he answered my question about a ride with solid encouragement. We tried to match schedules off and on for almost a year. Today we made it work. I didn’t want to be a bother and offered to just ride along while he practiced his routine. Fortunately he is a wise aerobatic pilot and knew I wouldn’t make it through his routine feeling well. (I was scheduled to fly with Bill right after.) He explained we would use a 10-point system, with 10 being how I felt right then, to keep track of when it was time to quit. After each maneuver I would give him the number according to how I was feeling. We did a briefing covering the plane, parachute, canopy release, etc. and planned that Dan would show me some basics and let me fly. Now we’re talking! Remember, at this point I have a couple hours dual-received instruction in the Pitts with Bill but even just touching the controls and flying straight-and-level is exciting. 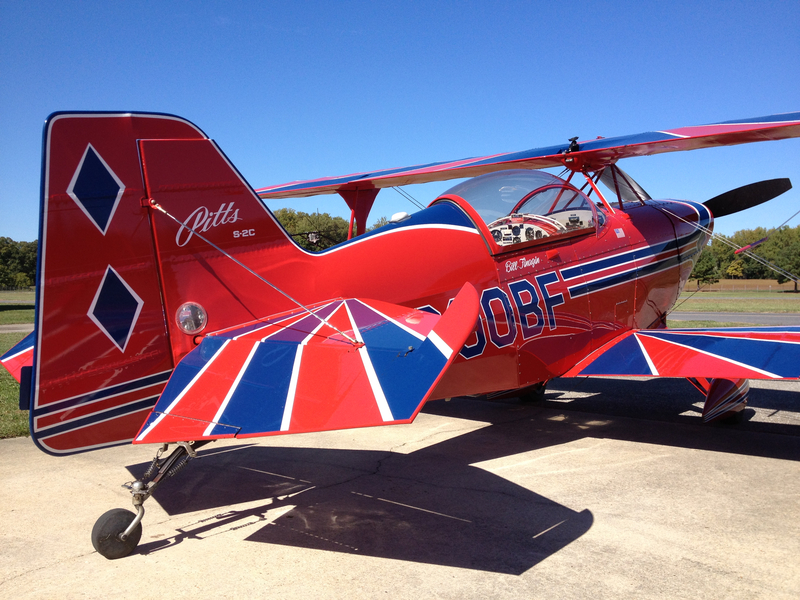 Imagine my excitement at getting to fly actual aerobatics!! Once in the practice area we got oriented with ground references and climbed to practice altitude. Dan would demonstrate a maneuver with me following him lightly on the controls then I would fly a few while he critiqued. We did loops, half Cuban Eights, and Immelmans. After each one Dan would check how I was feeling. Big surprise; I was feeling great! Like most aerobatic forms the loop is easy to fly and hard to fly well. (This simple fact is what I find irresistibly compelling about flying in general and aerobatics specifically. It takes a relatively short time to learn and a lifetime to master.) But the loop is important because it forms the basis for so many other maneuvers. He had me start with a hard 4G pull from level flight, while looking through the sighting device on the left wing. This is a simple wire structure with spokes making it easy to see both angle on the horizon and lateral position of the wing. Keeping it stable on a point of the horizon is the goal, since that means the airplane is moving in a circle along a consistent vertical plane in space and not wobbling. This tracking is controlled by the rudder but the pressures change at different points of the loop. At the initial pull up some left rudder is needed to counteract the gyroscopic force of the spinning propeller, approaching vertical the P-factor has more affect than the gyroscopic affect and some right rudder is needed. Approaching inverted and for the remainder of the loop left rudder is brought back in again. The forces are small but very noticeable in their absence. I’m only just starting to understand the nuance and hope to get the chance to keep learning more soon! Almost every aerobatic maneuver has dozens of subtle control inputs required to make it work. From the outside everything looks so easy and simple, when the fascinating reality is there’s a ton going on and a thousand minute judgments to be made every moment. The Half Cuban Eight starts just like a loop but instead of continuing down the back side, we stop the loop and fly an inverted 45 degree down line. In that line we half-roll to upright and then pull out of the dive. (A full Cuban Eight would then pull back up into the same maneuver again in the opposite direction.) It was a great novel feeling hanging on the seatbelts on the inverted 45 down line. I got excited and rushed the half-roll and the ending pull to level. Dan tried to get me to relax and draw the lines before and after the half-roll. These are factors aerobatic judges take into account in competition. The Immelman starts with a half loop but then stopping the loop at the top and exiting inverted, followed by a half-roll to upright. I can’t wait for my next taste of aerobatics. I’m pretty sure there is no going back from here. One of a long list of surprising things I’ve learned flying the Pitts with Bill is how much control we have with the rudder. I expected this, knowing the tailwheel training would require more rudder skills than a tricycle gear airplane like the Cessna 172. Of course I learned during my Private training to keep the rudder and aileron coordinated and to use rudder in the stall for directional control. But the limits of the training (which was 20 years ago already), and the Cessnas I learned in, kept the true magic from revealing itself. Being taught straight-ahead stalls, since spins were removed from the requirements, satisfied the regulations but didn’t really require any skill or greatly expand my flying experience. For that I’m sad. Had I been wiser I would have asked for a deeper introduction to stalls and spins. But that’s probably the definition of wisdom: knowing now how much we didn’t know then. Or maybe it’s just called aging. Fast forward to today and I’m in the Pitts, literally falling out of the sky, trying ever-so-valiantly-but-mostly-failing to keep the wings level…and the whole time cackling with the glee of the challenge! Bill calls it a rudder walk. I’ve heard/read what appear similar exercises called a ‘falling leaf’. It amounts to climbing to 7500′, putting the airplane into a full straight-ahead stall…then holding the stick back and keeping it there. The Cessna, as long as you don’t completely screw up with the rudder, would just drop the nose a bit and fall straight-ahead until you release the elevator and the angle-of-attack is reduced enough to get the wings flying again…stability is part of the design. 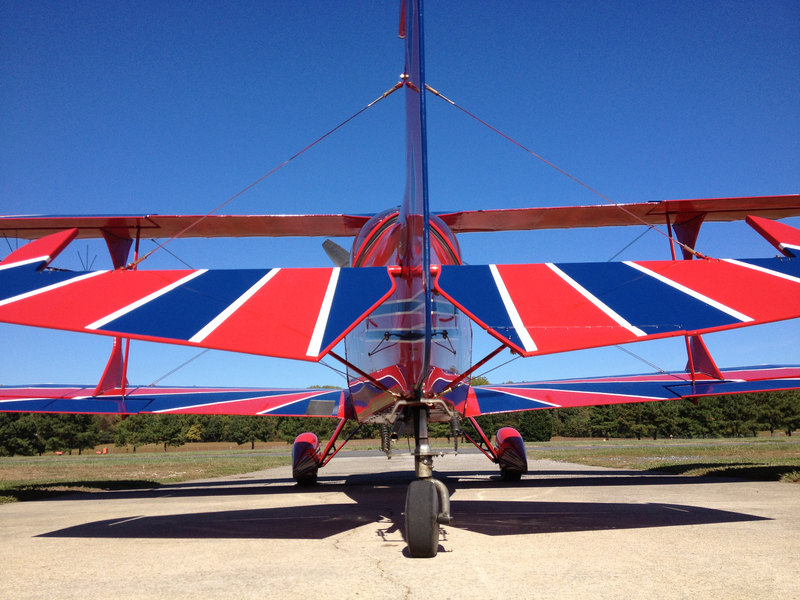 The challenge in the Pitts is it’s not designed to be stable; it’s designed for aerobatics. Just like the Cessna we keep the wings level, and in doing so avoid a spin, with the rudder. It doesn’t require much rudder, and by that I mean infinitesimally small amounts, but it does require immediate and forceful input. A “jab” and then back to neutral. With the wrong amount of rudder, or the right amount held too long, the Pitts will happily fall off into a spin. Once it’s starting to spin there’s no magic, just rudder, required to level the wings again and continue trying to keep them that way. Bill lets me practice this all the way down until we break the stall, recover at a safe altitude, and climb back up to do it again. Think of it like walking a balance beam. 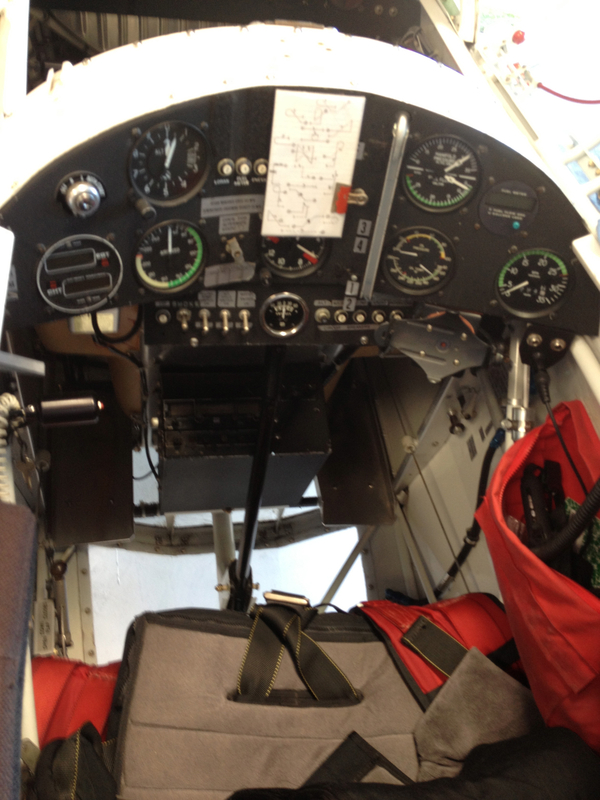 In the Cessna the beam is about 4 feet wide: I have to be aware of the edges but it’s not difficult to stay on top. I can make a change, watch and wait for it to take affect, then change again however is necessary. In the Pitts the beam is an inch wide…and round on top: there is still watching but I’m looking for the tiniest of changes and there’s no thinking, it is only feeling and reacting. The point of the exercise is to learn the same rudder inputs, here in the safety of altitude, that will be necessary to control the airplane on the ground rollout after landing. 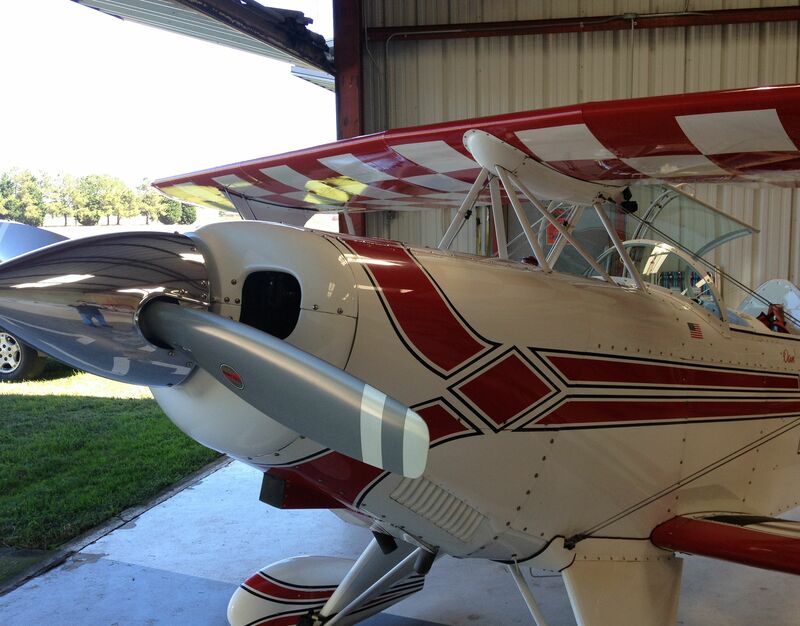 It’s one of the skills which an experienced tailwheel pilot employs without thinking…it becomes second nature. It’s important and it’s not easy, though I have no one else to compare my progress with. But it’s fun and it’s extremely satisfying to see improvement. For those who’ve read this far and are interested in more, here is an article with much better rudder information than I can provide. It was written for AOPA’s Flight Training magazine by none other than Budd Davisson, a long-time Pitts pilot and instructor. My second lesson with Bill today in the Pitts covered air work, pattern work, approach & landing, and ground handling/taxiing. We went down to Cambridge for the pattern and ground work. It was quiet and we mostly had it to ourselves. He started with the visual references I need to get on, and stay on, the downwind. We fly a relatively tight pattern, with the runway just off the lower wingtip when viewed from the cockpit, and bank to about 55 degrees. Much steeper than in a Cessna. The higher speed, tighter pattern, and steeper banks are all new challenges for me. The Pitts is both demanding and tremendously rewarding in that regard. It will do everything we tell it to, instantaneously. We need to be very sure what we’re telling it to do. The first couple trips around the pattern he had me do a low approach, flying the length of the runway at about 10′, while holding altitude and runway alignment. I felt OK holding the altitude but struggled with alignment. The P-factor at the relatively low speed and high angle-of-attack is remarkable and takes a lot of right-rudder to compensate. I was drifting left consistently. An even larger bootful of right-rudder is needed when applying full power to climb out again. All of these forces (adverse yaw, torque, slipstream, p-factor, gyroscopic precession) are present in the Cessnas I fly but are so damped they’re almost hidden. Every Private pilot learns about them, and right-rudder is always needed climbing at full power and low airspeed, but the relatively low-powered, heavy Cessna hides everything from me. The Pitts puts all these forces, and my ignorance of them, on full display. I feel like I’m only now learning to actually fly. Bill had me fly a landing to touchdown and then took the controls when I botched the rollout. Giving them back once clearing the runway he introduced me to the ground handling and zero forward visibility. We also did a couple high-speed taxi runs down the runway to get me the feel of the rudder. It’s very clear why the feet and rudder work is so important…there is a magic to feeling and responding that has to be learned to the point of reaction; if I have to think, it’s too late. Bill had me do the takeoff (he’s following me on the controls through all of this work) and that felt good. Not that I performed well, there were no directional upsets I needed to correct, simply that it felt good. Applying full power, hearing the engine spin up, feeling the tail start flying, accelerating quickly to takeoff and then climbing like a rocket just plain feels really, really good. It was only 1.3 hours of instruction but, even with a 10-minute break while fueling in Cambridge, I was completely wrung out…sweaty and tired. Both mentally and physically. (Yes, I’m pretty sure I was mentally sweaty.) Eventually I will learn to relax into all the new sensations and my workload will reduce as my skills improve. For now though, I’m sure I’ll continue to experience an odd combination of two conflicting needs: desire to fly the Pitts all day long everyday, and the need to rest and absorb what I’ve learned. It’s amazing to me how satisfying this airplane is. It feels right. By contrast a Cessna 172 feels like running through knee-deep mud. 2.3 hours in the Pitts and I’m completely sucked in. Obsessed. Addicted. Already worried about what happens when I’m not flying it anymore. So much so that I’m consciously avoiding thinking about any possibility of continuing to train with Bill after the tailwheel endorsement. I’ll try to find a taildragger to rent for the time being and let my obsession moderate. Maybe when I can think clearly again I’ll look into the realities of what it would take to continue chasing the dream of aerobatics in the Pitts. At the same time I also can’t wait until my next lesson on the 18th! 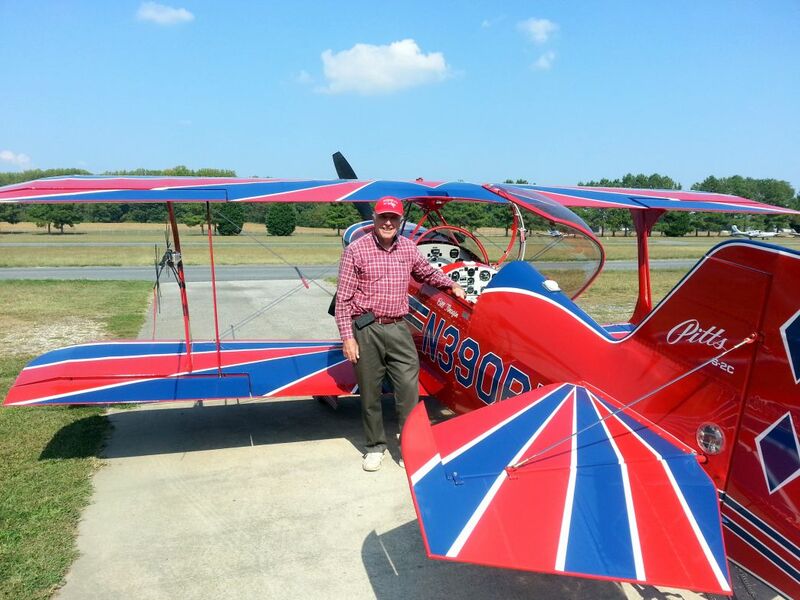 I flew with Bill Finagin today in his Pitts S-2C. I don’t often use “OMG” in my communication. It’s a kinda pithy, overly trendy exclamation usually befitting situations in which we’re otherwise speechless. I’m often not speaking but I’m rarely speechless. Today I’m speechless. 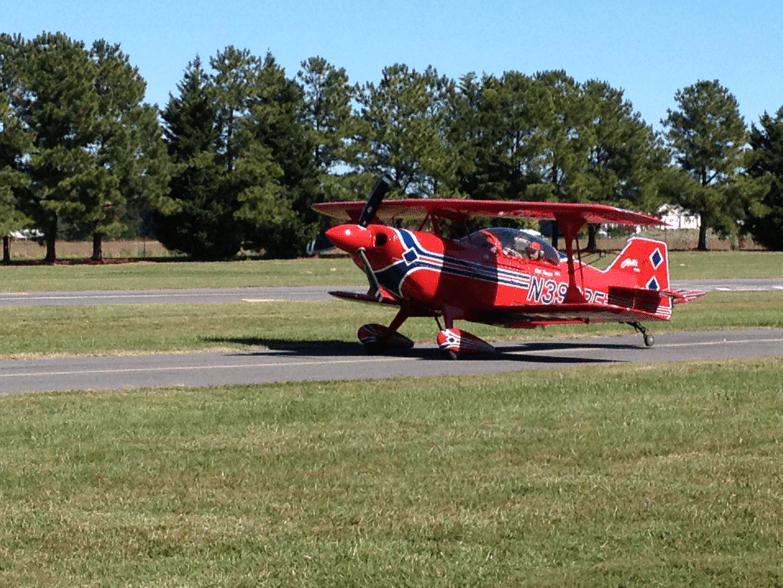 It wasn’t even a very aerobatic lesson, but it was transformative. Awesome, truly, in the non-colloquial use of the word. I’m technically not doing aerobatic training right now, rather working on my tailwheel endorsement. But having the opportunity to do it in the Pitts with Bill (a Pitts expert and aerobatic legend) was way too much opportunity to pass up. (We live .6nm from the field, right under his base leg for runway 12 at Lee Airport.) He did a nice and simple briefing on the very basics of the physics to get me started. Then we went over the Bay, working north of Easton’s airspace, and climbed to 7500′. He showed me the basic pitch and bank visual references, rudder coordination drills (the rudder walk…more on this humbling, fascinating drill later), loops, hammerhead turn, and all the associated references. We did two touch-and-go’s at Easton to introduce the landing cues then headed back to Annapolis where he covered the pattern, approach, and landing again. I’m so screwed. 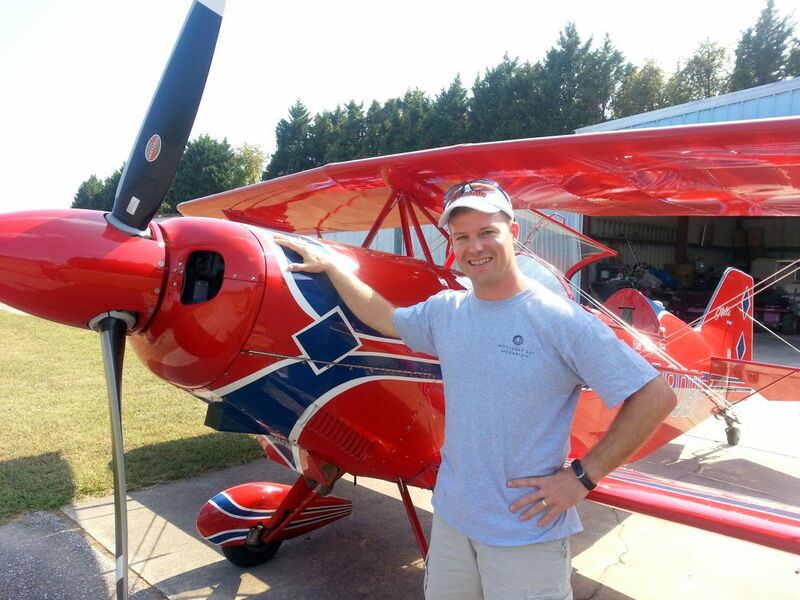 I think I need to earn enough to own a Pitts and fly/teach/compete aerobatics. This could be both the best week of my life and the worst. I am so screwed. …and I’m doing it again tomorrow! I’m starting my tailwheel endorsement training tomorrow.